Another book was opened, which is the book of life. The dead were judged according to what they had done as recorded in the books. He [Christ] testifies about what he has seen and heard, but no one accepts his testimony. Be careful not to allow anyone to captivate you through an empty, deceitful philosophy that is according to human traditions and the elemental spirits of the world, and not according to Christ. For in him all the fullness of deity lives in bodily form, and you have been filled in him, who is the head over every ruler and authority. The book that John the Divine glimpsed on a mushroom trip, set down in Revelation then shut up for 2,000 years is now open again. Now the New Covenant is here and The Silence is over, it is time for you to grow up, Man. In reality, there is no Darkness, only Ignorance. If you live by the Maxims of Law, you will know that ‘the World’ is synonymous with the financial system and the governments, societies and the civil codes which it creates. If you have understood my teaching, you will know that the Bible tells a prophetic and figurative tale. You will therefore know that ‘Israel’, ‘Jerusalem’ and ‘Egypt’, all have figurative and higher meanings which have little to do with the geographical locations. In the Old Testament, ‘the World’ is ‘Egypt’. (Hence Christ ‘comes out of Egypt’). In the New Testament, it is ‘Rome’. To the True Israelite, the Rastafarians and many others, it is simply ‘Babylon’, the Aramaic for the Hebrew BBL, ‘Babel’, meaning ‘confusion’, preserved in the English word ‘babble’ (and some might say ‘Bible’, before the TTFT clarified its message). The State of ‘Israel’ therefore has no right to the land it stole off Palestinian farmers 65 years ago. That is My Father’s judgement and therefore my judgement. The publication of the Third and Final Testament brings to an end the 6,000-year Dark Age — known as the Kali Yuga in the Vedas — which began with the collapse of the original Tower of Babel. (This New Age is also marked by the building of the seemingly incomplete Shard often referred to as the New Tower of Babel). On the surface of it, The World may not look like it has collapsed but only because the Bank of England has created nearly £400 billion of new currency or new debt out of thin air in the last few years to prevent this. To put this in context, it took over 300 years for the National Debt to rise to the ‘original £300billion. And very little of that £400billion has gone into the wider economy. TO PRONOUNCE HIS FATHER’S NAME? Be Yad YHVH, ביד יהוה = 42. No rule of law protects anyone who wilfully closes his ears to information, or refuses to make inquiry when circumstances of grave suspicion imperatively demand it. How can you believe a dead man who’ve never met was Jesus Christ? After all, the Bible says that Christ has – like the Father – ‘life in himself’. What is this man who lives and does not know death? Every week, the UK is paying the banksters around £1billion in interest alone on the national debt. None of that £1billion actually goes towards paying off the principal. To put that in perspective, it cost only £545million to build the flagship Queen Elizabeth hospital in Birmingham, which opened in 2010. As the citizens of the World are expected to pay back national debts out of taxation on their labour, they have the power to deliver the coup de grace to The World by simply refusing to pay. If they do not refuse, they condemn their children – and the poor of the Third World — to a life of slavery. To the seven billion of you who failed to make the Novo Ordo Seclorum by the 24th December 2012, the Christ has bought you more time, a second chance. This time though the stakes are higher. If you cannot see the way forward, the way of love, then you really will forfeit your immortal soul forever and die without any possibility of redemption. The Third and Final Testament is therefore My Father’s final word on the matter of redemption, helping to decrypt the Old and New Testaments — or ‘covenants’ as they are known in Hebrew, the original language of the Torah or Jewish Bible — and reveal My Father’s True Message to man. It is not intended to be exhaustive, particularly in the evidence it provides. The list of prophecies of a Chosen One, for example, misses out Rastafarianism and the predicted coming of Jah, among others, even though reggae and the work of Bob Marley in particular is probably the purest hymn to the Prophecy outside the Third and Final Testament. But that is because the Bible is not there to spoonfeed you. It is there to inspire you to witness God’s creation for yourself so you might bring experience and wisdom to your interpretation of it. Chapter and Verse — constitution, case law and authorities — showing how God’s Law is recognised as a higher law than anything in their legal system — within that system! ♦ it is the word of God presented by a prophet – in this case, the last prophet, the Chosen One. 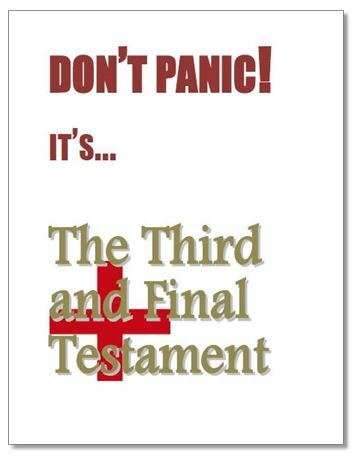 ♦ it contains literal truth, an exposition of the Law and guidance on the best moral conduct expressed through reference to other parts of the Bible and told through a series of modern parables . ♦ it has deliberate mistakes, misdirection and presents a code to decrypt. Like the original bible, it leaves you in no doubt about your duties in the run-up to the New World or Promised Land, post-2012 yet still leaves room for you to join up the dots yourself on your journey to redemption. Like the teachings of the Biblical Christ, it places primacy on love and individual responsibility and warns of the dangers of corporate consciousness: groupthink and mob rule. Like the Old and New Testaments, it is unequivocal in its condemnation of usury. It is unlawful to pay any debt raised at interest, including but not limited to mortgages and credit cards. It is unlawful to make money simply from money. Like the original bible, it is funny and playful, ready to misdirect the unwary, with flagrante (and subtle) errors ever ready to puncture the pomposity of those who blindly follow rather than check things out for themselves. My Father wants teachers, not pontificators. The psychophaths and ne’er-do-wells of the London press, take note. Like the original, it is full of codes hiding a secret of enormous importance to humanity but also provides the key to the code’s solution ‘for those who have eyes to see’. It is traditional in that it has no chapter or verse numbers. ♦ the third part takes the form of a thriller, the predominant and most popular form of recent culture. ♦ it quotes from the work of man to demonstrate that God’s Law has always been here and available to those who knew where to look, not just in the Bible. 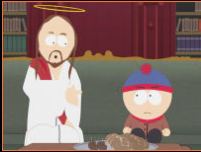 If you still thirst for modern parables then I refer you to the excellent work of Matt Parker and Trey Stone and the expression of their genius in South Park. In fact, the first TV programme I saw after my anointment was Super Best Friends. In it, Jesus Christ — a man with no special powers — is charged with saving humanity from the evil and magical David Blane. In order to bring about his mission, Christ calls on Khrishna and Buddha, other incarnations of the Jesus soul. The Prophecy is everywhere (for those who have eyes to see)! 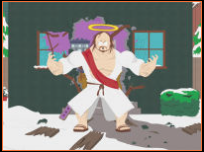 Christ has appeared many times in South Park. Due to copyright law, we can’t link to the Super Best Friends episodes but above are links to clips showing Christ.